Features a biomechanical orthotic footbed to help prevent over pronation and realign feet to their natural position. Need orthotic support to treat and prevent bunions in warm weather, at the beach, after sports or when your not wearing shoes around the house? 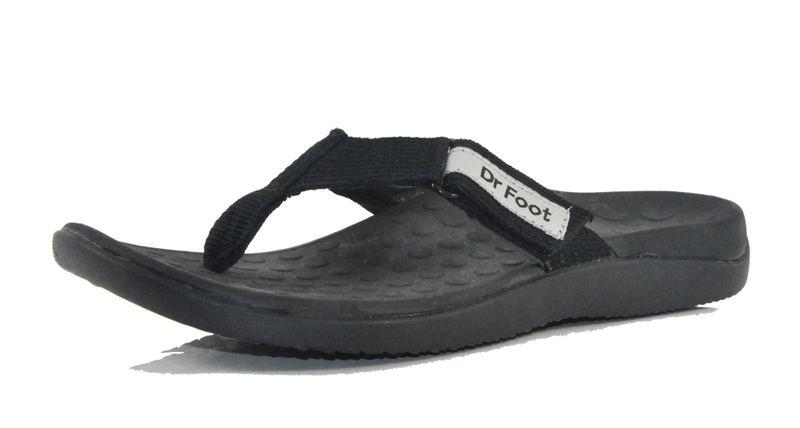 You Need the Dr Foot Orthotic Sandal! 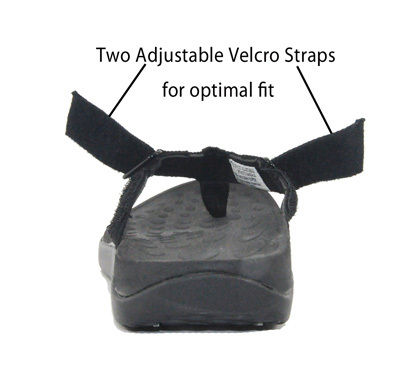 The Dr Foot orthotic sandals are unique orthotic sandals which not only feature a built in orthotic to support every foot step but also have two adjustable velcro forefoot supports to ensure an ideal fit. 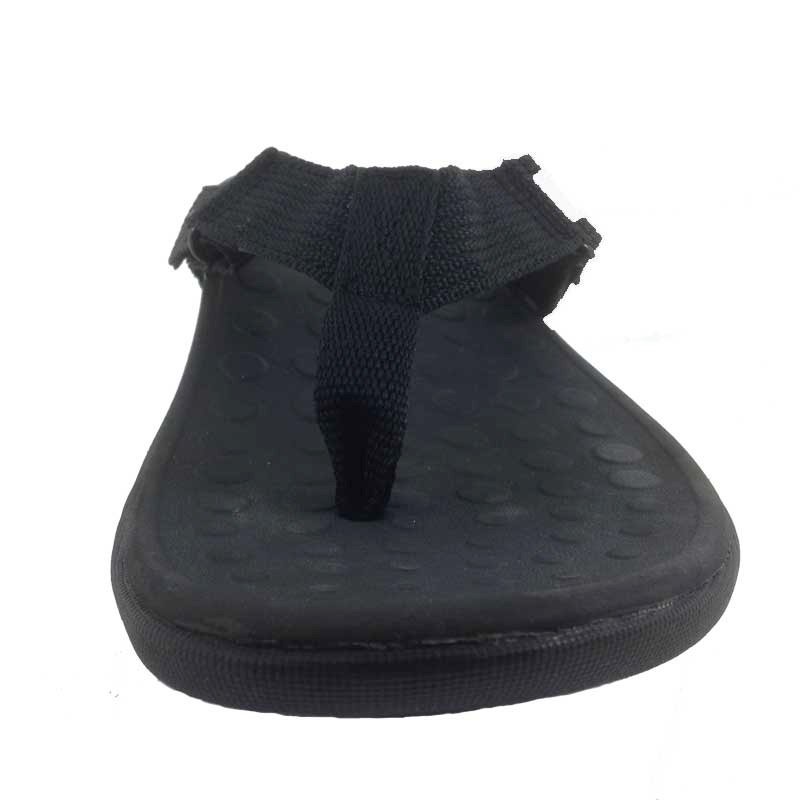 This orthotic sandal provides an improvement to open or loose orthotic footwear by the inclusion of forefoot dual adjustable Velcro straps for comfort, fit and medical benefit. Dr Foot Adjustable Orthotic Sandals are unique wide fitting orthotic sandals which feature a built in orthotic to support every foot step. Designed by Dr Foot podiatrists this sandal offers biomechanical support to relieve foot pain such as heel pain, plantar fasciitis, bunions, flat feet, leg pain and other foot conditions. The integrated contoured 4 and half degree orthotic arch support ensures dynamic support from heel strike to forward propulsion. This is the perfect sandal to complement our Dr Foot orthotics range to treat your foot and leg pain when you are not walking in your shoes. *Two adjustable forefoot velcro straps to ensure a perfect fit. *The Dr Foot Adjustable Orthotic Sandals are designed to positively affect your foot posture, alignment and reduce over pronation which is when your foot rolls in too much. *Easy to use orthotic support when not in shoes, complement our Dr Foot orthotic range perfectly. 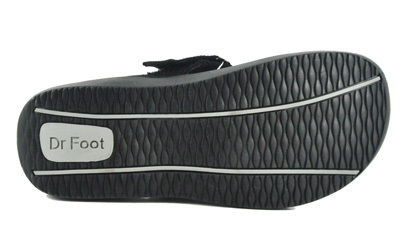 *The comfortable woven toe post and foam lined strap provides a luxurious fit. *Deep heel cup provides shock absorbing and the durable rubber outsole provides traction on all types of surfaces. Please note these sandals cannot be sent to the USA.